Apple has re-released iOS 12.1.2 within days after its original debut on Monday. Notably, the second build of iOS 12.1.2 is available for download for those users who didn’t install the update previously. This means users who already updated their iPhone models to iOS 12.1.2 following its arrival earlier this week won’t receive the second build. The original software update brought bug fixes for eSIM activation on the iPhone XR ₹ 70,849, iPhone XS ₹ 94,281, and iPhone XS Max. The changelog is apparently the same in case of the second build. 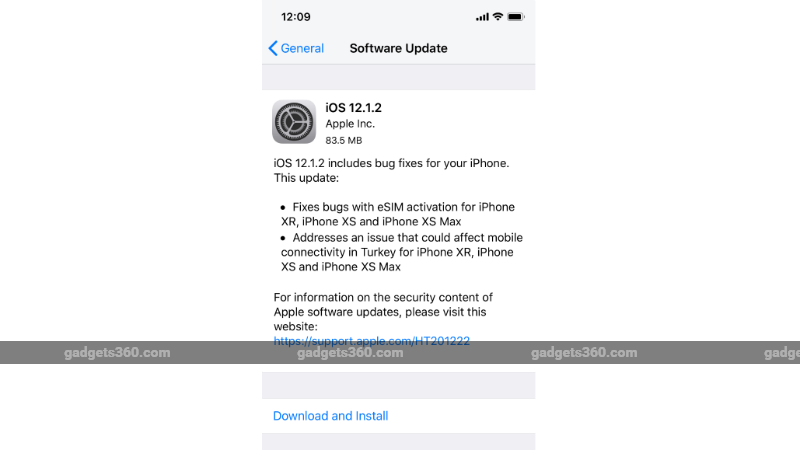 To recall, the iOS 12.1.2 update was released earlier this week along with bug fixes for eSIM activation on the iPhone XR, iPhone XS, and iPhone XS. The new version also addressed an issue that could impact cellular connectivity in Turkey specifically on all the 2018 iPhone models.